Ever been in a situation where you are working with your laptop or desktop, handling your kids, cooking some food or involved in any other activity and you wanted to pick up your phone and send an e-mail, browse through Facebook, views some pictures on Instagram or do any kind of task? But you cannot use your phone while you are doing something. What if I tell you that you don’t need your hands to use your phone and just could control your phone without touching it while you are performing any other activity. Control your phone from your computer. Control your computer from your phone. This trick may also be useful for people with severe injuries and even for people who are bed ridden and wants to access their phones without having to actually pick it up and touch it. The app that lets you do all of the things as mentioned earlier is known as EVA Facial Mouse, which is currently an open source application so you can feel free to access and modify its code to your liking if you are a developer who wants to make the world better and tech easier for people. What it does is that it uses the front/selfie camera on your smartphone and then allows you to use your phone by placing a crosshair on the top of your device and a cursor on your smartphone’s screen. So, basically, it detects the motion of your eyes by using the front camera of your device and then positions and moves the cursor on your screen accordingly, allowing you to control your smartphone without actually touching or holding it. Well, of course, you need to be in a well-lighted place for it to work and obviously you must own an Android Smartphone with a decent front camera and the rest is taken care of by the app. Once you install the app, it then asks you to enable the accessibility feature to control certain aspects of your phone like opening and closing of apps, controlling your volume and then it detects your face using your front camera. After the initial setup, you can increase or decrease the parameter values to control the speed of the mouse pointer to your liking. 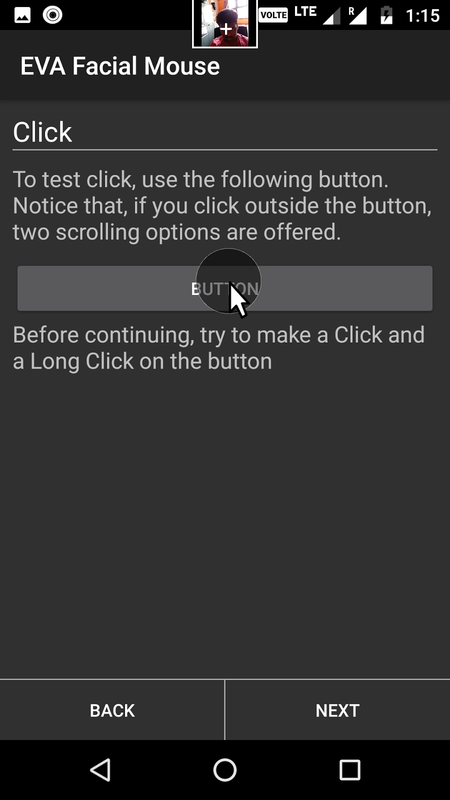 In the upcoming screens, you will be presented with a set of tutorial options like how to click buttons, how to navigate through your phone, how to use your keyboard and similar things. Finally, you can now start controlling your phone without touching it by just using your eyes and nothing else. As you can see in the above clip, I have opened the settings of my launcher and then tried to control the animation of it without touching my phone. You can also see several icons on the left of the screens which can be used as navigation buttons and there is also a keyboard that comes with the app and scrolling buttons that help you to scroll through web pages or social networking apps without touching your device. Feel free to try this app and comment below on your experiences and share this post with your friends if you found it useful and exciting!